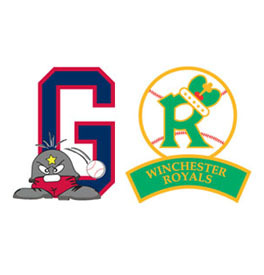 A three-run sixth got Waynesboro back in the game, but a ninth-inning rally ended in dramatic fashion with Cody Hudson thrown out trying to steal third with two outs, sending the Generals to a 6-4 defeat at the hands of Winchester Saturday night. The Royals had jumped out to a 6-1 lead with a three-run fifth off starting pitcher Brian Atkins seeming to give them control. The Generals scored three in the sixth, with T.J. Kuban getting things going with a two-out single. Devin Smith worked his way back from an 0-2 count off Winchester starter Matt Zahel (2-0) to reach on a base on balls. Jared King, who had already doubled twice, tripled on a 1-2 count to score Kuban and Smith. King then scored when Winchester centerfielder Kevin Brashears lost a Haskell Fink flyball in the lights. Waynesboro got two on with two out in the seventh with singles by Jon Clinard and Grant Fillipitch, but Kuban lined to second to end that threat. The Generals were able to send the winning run to the plate in the ninth when Fillipitch came up with two on and two outs. Hudson was thrown out at third trying to steal on the first pitch to Fillipitch. Atkins (1-4) took the loss, working seven and two-thirds innings and giving up six runs on 12 hits.